Personal consumption is 70% of the US economy. While much of this is Government controlled (Medicare), untethered to actual consumer choices, it’s a large enough number that many focus upon consumer health and sentiment for clues to economic trends. 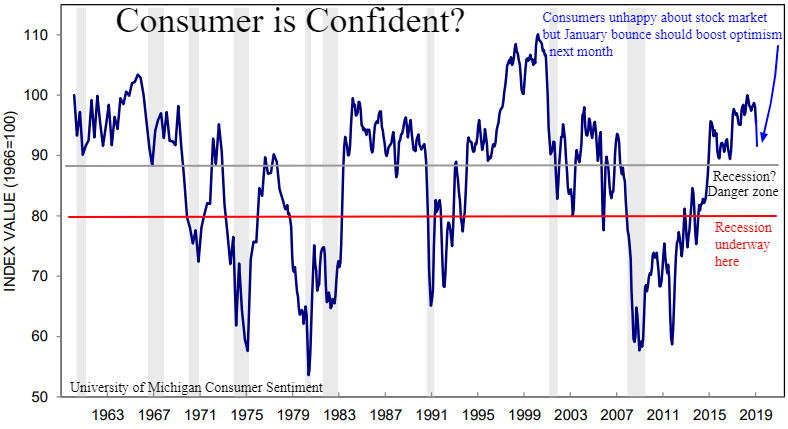 After reaching a euphoric 18 year high a few months ago, confidence has fallen to 2 year lows as of early January. The economy would be in trouble of stalling if workers became increasingly pessimistic and curtailed normal spending habits. In the big picture this measure of sentiment remains healthy with the current drop likely to reverse upwards with the resplendent stock market ascent of the past few weeks. The consumer has buckled but will remain unbowed if the US Government reopens and the China trade dispute is resolved. Another measure of personal consumption is illustrated by Redbook’s same store sales results. Despite the slow economy during the Obama era we maintained robust spending habits that never witnessed same stores sales in contraction. After the Trump tax cuts in 2018 juiced what may be the best annual GDP growth in 14 years, same store sales surged to a record 9.3% growth rate over the holidays. Despite the drop in consumer confidence there has only been a tiny downshift to 7% sales growth. We suspect same store sales falling back to 4 to 5% growth rates would be normal in a good economy. There are no warning flags here yet. Personal income and wages are of course another measure of consumer health. More companies increase wages during economic expansions and very few will elevate compensation during recessions. Clearly employers today are sharing their good fortunes as a record % of small businesses have boosted pay for their workers in recent months. These 59 million employees in the small business sector have more spending power to sustain the economy as long as the politicians don’t fumble the ball on Trade and symbolic Government shutdowns. Further supporting the strong confidence and near full employment state of our economy is today’s report of jobless claims falling to a 49 year low – a record low adjusted for the working age population. From the ownership perspective of small businesses, it’s clear to see the historic surge in optimism when Trump was elected. This ebullient pro business sentiment likely contributed to increased expenditures and employment trends as profits jumped in 2017 and 2018. Small Business sentiment fell last month in line with the drop of Consumer Confidence levels, but this is a modest decline from recent historic extremes in optimism. The Small Business sector was still in recession recovery mode until 2017 before jumping to euphoric heights. The blip lower was inspired by Fed rate hikes and China trade war fears as well as the 20% slide in stock indices. So far these are temporary news driven blips that have spilled over into slowing new order growth, but easily recouped should trade anxiety with China fall into the rear view mirror with a new deal. As an aside, our personal involvement with global manufacturing confirms that new orders are slowing. However, with backlogs, material prices an overtime pay all falling from record highs, we view this as the pause that refreshes: as long as it only persists a few more months. The American consumer is healthy, but isn’t invisible. Their spending habits will ebb and flow with the news of the day over the worries of tomorrow. A renewed trade war after the March 1st deadline would hurt the consumer and the stock market. The good news is that incomes are rising, the middle class is being absorbed by the upper class, debt service and default rates are extremely low, inflation isn’t a factor and virtually everyone who wants a job has a record number of openings to choose from. The strong sentiment of small businesses and consumers have been dented, but any serious body blows tipping the US into a recession or even sub 2% growth is in the hands of politicians. Normally our leaders deserve minor credit or blame for the economy, earnings and spending habits. This time we have broader agendas being pursued that have a potential multi month influence. The current Government shutdown and China trade fears are the swing output influencers in coming weeks or months. 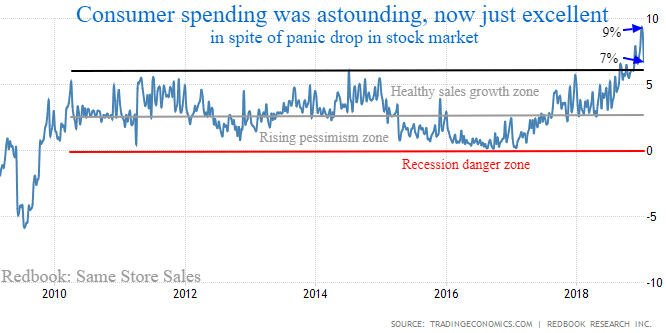 The potential good news is the pent up demand from the current uncertainty will lead to an economic rebound back to the previous trend-line spending when fears abate. However, the longer we remain in limbo without deals, the closer our GDP will drift towards contraction. For now we continue to expect positive resolutions. While the long term economic picture requires a strong enforceable trade deal with China, the near term economy and sentiment in 2019 only require any deal that Trump approves. We still view the underlying GDP trend in the 2 to 3% range for the portion of 2019 that is unencumbered by political deal making ambiguity.